Using IATE just got easier! Technical changes are afoot in the IATE public interface, making the inter-institutional terminology database easier to use than ever. One new feature is the implementation of autofill in the search bar – making it faster and easier than ever to search IATE. After typing three letters, IATE Public does a “pre-search” of the database and proposes suggestions in a drop-down list. You can then select one of them by clicking, and launch the search. 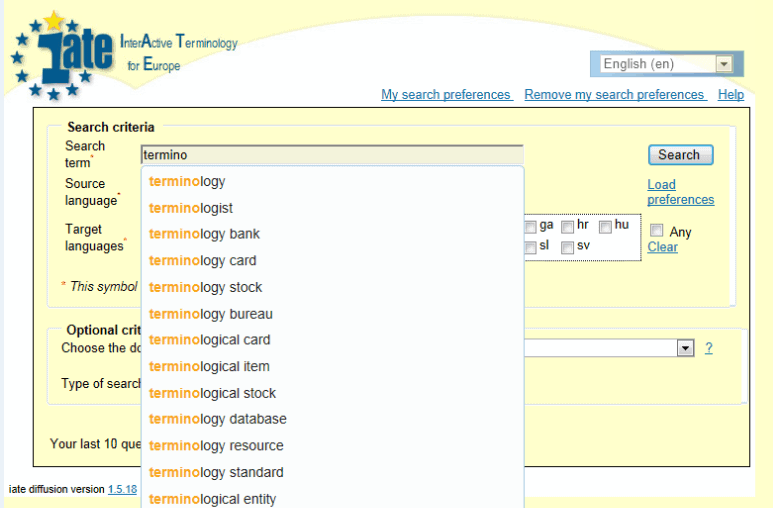 This functionality is available to all the languages used in IATE Public and is a convenient time-saver if you are searching a multi-word term like, for example, ‘terminological data bank’! In addition, IATE public is now updated in real-time – previously updates were only inserted once a month. Internal IATE internal and public IATE now share the same database so any changes to internal IATE will also automatically appear in public IATE about 2 or 3 minutes later. This means that the public can now immediately access the most up-to-date validated EU terminology and ensures that terminology for the very latest EU texts is easily accessible to all. The IATE database now contains over 1.4 million multilingual entries related to a wide range of EU domains and covering the 24 official languages of the EU. Article written by Sarah O’Farrell, translator and terminologist for Terminology Coordination Unit.